Do you wish you were standing in front of the glorious Bellagio fountains in Vegas right about now? Would you settle for a dancing water show right on top of your desk? Having a pair of these Dancing Water Computer Speakers place you in a wonderland of sounds. 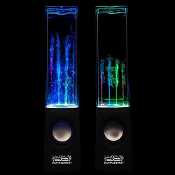 While incorporating a wide variety of elements such as lights, water movement and music, these speakers bring you a highly enjoyable desktop lightshow.